If you’re tired of feeling uncomfortable in that one room that never seems quite cool enough, a ductless mini split air conditioner can help you reclaim the space. 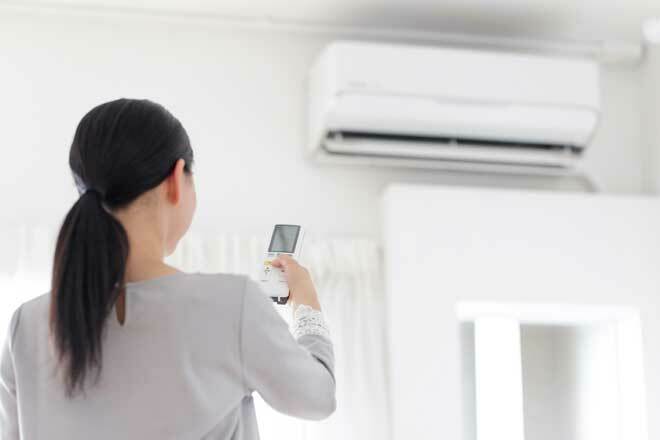 Also known as ductless heat pumps, these systems offer a practical, flexible, and energy-saving way to supplement or replace a central heating and cooling system. A conventional central air conditioner uses a single large air handler to cool air, then pushes the cooled air out to your rooms via the ducts. A ductless mini split, however, uses a separate small air handler for each room or zone it cools. These air handlers, which are typically mounted on the walls, supply cool or warm air directly to the room without the need for ducts. Despite their benefits for hard-to-cool spaces, ductless systems aren’t always the best option for large, open floor plans and they limit your options for accessories. They don’t come cheap, either. Installing or expanding a ducted system requires tearing up part of the attic and walls to put in the ducts. This is not only labor-intensive, expensive, and messy, but it could also do irreparable damage to a historical home. 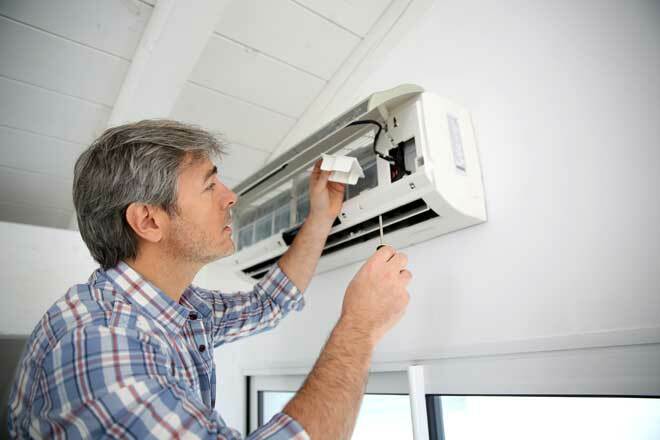 To install a ductless system, the only construction work necessary is a three-inch hole drilled in the wall to run the conduit line between the indoor air handler and the outdoor condenser unit. The whole installation process takes just a few hours. Indoor air handlers can be mounted on the wall, installed flush with the ceiling or placed on the floor. Most are only around 7 inches deep, so they take up little space. With so many options, it’s easy to find a position for each air handler that won’t interfere with your furniture placement or use of the room. Because most air handlers are mounted above head level, you can easily re-arrange your furniture without worrying about blocking an air vent or radiator. Ductless systems are some of the most energy-efficient forced-air heating and cooling systems available. Many achieve a SEER in the 20 to 25 range, and some reach efficiencies as high as SEER 28. Even the most efficient duct systems still lose a certain amount of energy due to air leaks and heat transfer. Ductless systems don’t have this problem, which gives them another efficiency edge over central A/Cs. With a ductless system, you’ll only need to turn on the air handlers in rooms where you need heating or cooling. That saves you energy and money compared to a ducted system that heats or cools every room in your house, whether you want it or not. Ductless systems let you control the temperatures in different parts of the house independently. This makes them ideal for homes where some areas tend to stay warmer or chillier than others. If your downstairs bedroom is a little chilly on winter nights, you can turn the heat on there without overheating your other rooms. If your upstairs office heats up fast on summer mornings, you can turn on the room’s A/C without freezing the rest of your family. Ductless indoor air handlers can run at a noise level as low as 19dB(A), the equivalent of gently rustling leaves. There’s no indoor unit with a large fan that makes noise every time the system kicks on, no ducts that clang and bang with changes in temperature, and no popping, pinging radiators. Outdoor units average around 60dB(A), the level of a normal conversation. The typical ductless system condenser unit can run up to four indoor air handlers, enough to handle 1,500 square feet. If your house is larger than that, you’ll need one or more additional condensers to run more air handlers. To keep your home as comfortable as it would be with a central unit, you’ll need an air handler in each room. A particularly large zone, such as a great room or a room with high ceilings, might need more than one air handler. In this case, it’s best to run all the air handlers for that zone at once to avoid overworking any one unit. The purchase and installation cost of a ductless system is around 30 percent higher than for a new central unit, assuming your house already has ductwork. The cost difference gets even greater if you have a large house and want to put an air handler in every room. While ductless air handlers are designed to be inconspicuous, they never blend in as well as the floor registers of a central unit. If you have exacting plans for your interior decor and find a plastic air handle on the wall or ceiling vents unsightly, stick with a ducted system. With a central system, you have the option of adding an air purification system, or a humidifier or dehumidifiers to improve the air quality throughout your whole home. Central systems also make it possible to add ventilation air from outdoors. Besides air filtration, none of these extras are possible with a ductless system. Finding technicians who have the skills to install ductless systems is harder than finding those who can work with central air conditioners. If your ductless system is sized, designed or installed incorrectly, its effectiveness and efficiency will suffer. 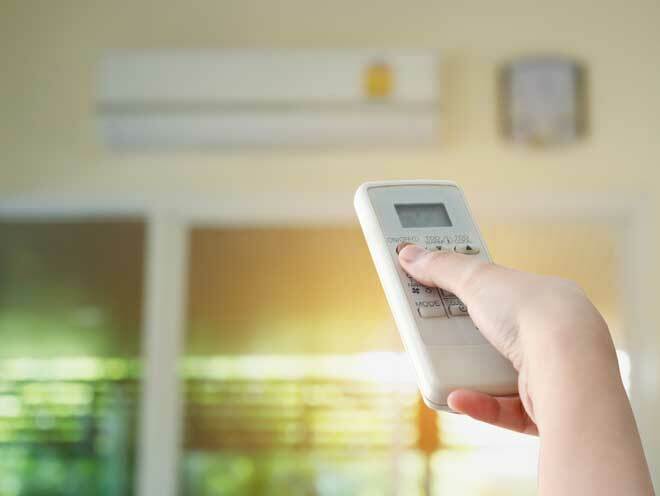 A ductless mini split air conditioner is a practical way to get more comfortable temperatures in parts of the house that are hard to heat and cool. It’s also a good choice if you want total control over the temperatures in different parts of your home. The initial cost of these systems can be high, though, so if your home already has ductwork, it’s more cost-effective to upgrade your existing system or even opt for a conventional heat pump than to switch to a ductless system.